Got Zucs? We have a good neighbor that has been keeping us supplied with zucchini from his garden patch. 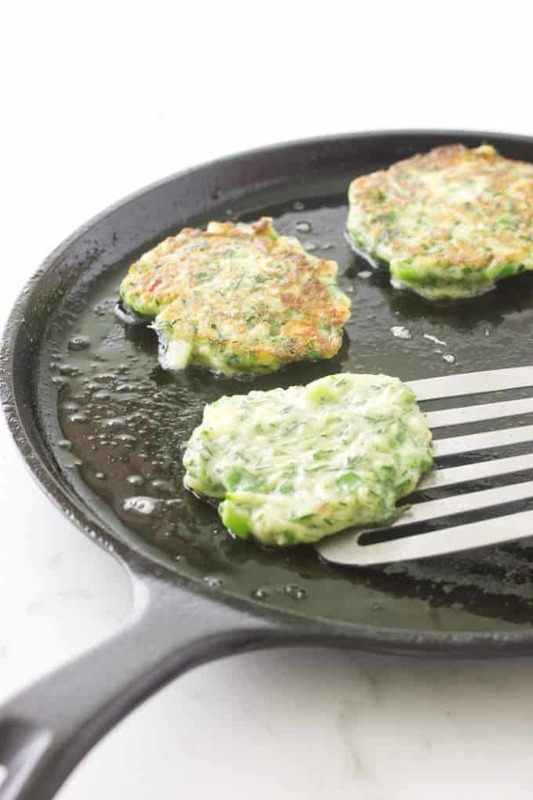 Now is the time to make good use of them in our Gluten-Free Zucchini Fritters! Crisp on the outside and full of herby-cheesy goodness. You are in for a treat. 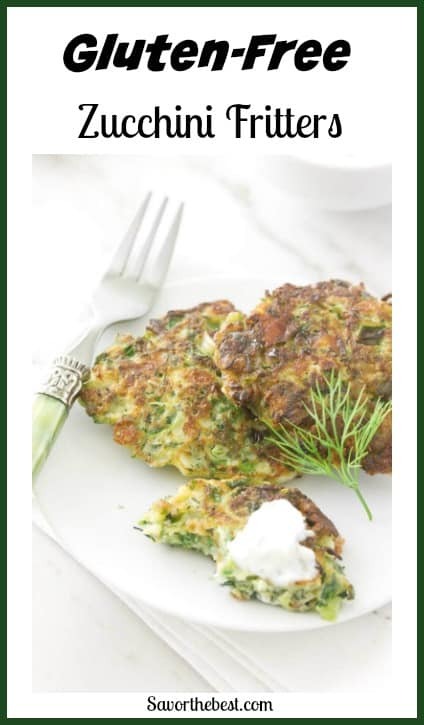 Gluten-Free Zucchini Fritters! Crisp on the outside and full of herby-cheesy goodness. Zucchini is a summer squash that appears to grow inches overnight. They can quickly become huge monsters within a few days. Another name for this prolific vegetable is courgette. Although this is a summer squash it is available in our grocery stores throughout the year. 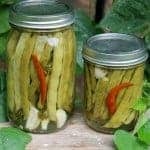 What Can I Do With Zucchini? Crisp Gluten-Free Zucchini Fritters. 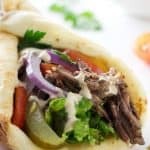 Served with a dilly Greek yogurt sauce. If you are gluten-intolerant or gluten-sensitive you can also enjoy these fritters. We used our Ancient Grains Gluten-Free flour Blend in place of the usual high-gluten all-purpose flour. Our gluten-free flour blend tastes just like a regular all-purpose flour and binds just as well. If you are unable to eat products with gluten flour and have not been satisfied with the gluten-free four options, please give our blend a try. 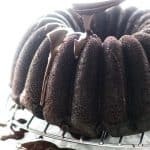 But if you have a favorite gluten-free flour blend, then this recipe works very well with other gluten-free blends. Please be aware that not all gluten-free flours behave the same. Aside from our Ancient Grains Gluten Free Flour, this recipe works well with Cup4Cup as well as Pamela’s Gluten Free Flour Blend. We are sure there are several other gluten-free blends that would work, but these are the only ones we have tested. 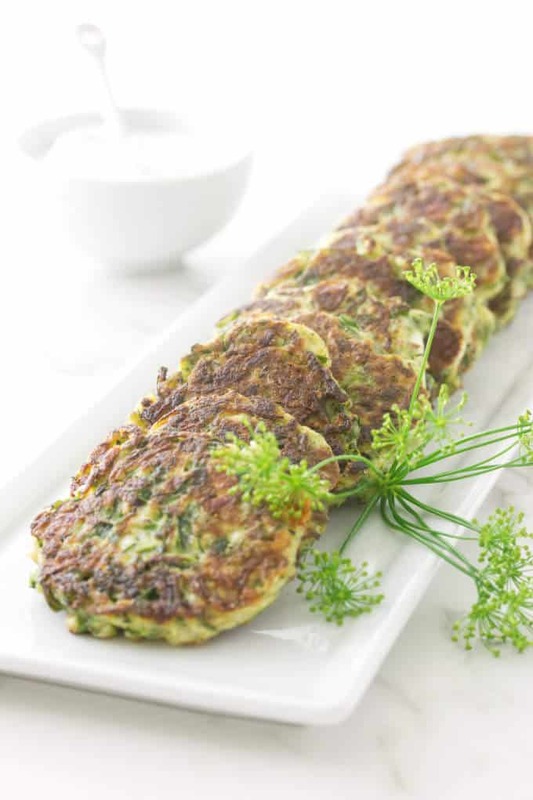 Zucchini has a very high water content and this must be taken into consideration when making zucchini fritters. We want crisp, crunchy zucchini fritters so most of the liquid has got to go. 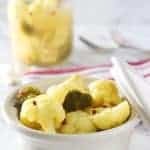 First, set a colander over a dinner plate and drape a kitchen tea-towel over it. Wash and grate the zucchini. While a box-grater works for this task we used the time-saving grater attachment of the food processor. Add the shredded zucchini to the lined colander and toss it with salt. Let the mixture sit for ten minutes. The salt will pull out the water and keep the fritters crisp. Letting the salted zucchini sit for ten minutes will only partially remove the water. You will need to squeeze that stuff really good. Pick up the tea-towel by the corners and hold the bundle over the kitchen sink. Twist and squeeze the towel to wring the water out of the zucchini. There are other methods to remove the water from zucchini and Mel at melskitchencafe.com has a video that gives you three different options. Don’t try to make the zucchini too ‘dry’ as you do need some moisture in your fritter batter. Otherwise, your fritters will be tough and chewy. 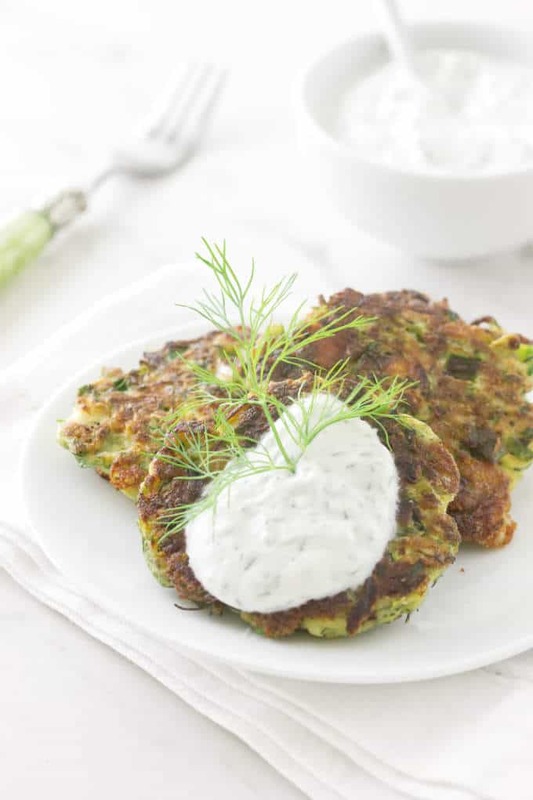 Gluten-Free Zucchini Fritters with Greek yogurt dilly sauce. Add that clump of zucchini to a large mixing bowl and fluff it up with a fork. These fritters combine the grated zucchini with the tang of crumbled feta cheese. They also have a substantial measure of freshly chopped dill, parsley and garlic. A pinch of red pepper flakes adds a bit of zest to the mix. The gluten-free flour blend and a couple of eggs give structure and holds the mixture together. To cook these savory little bites we used a kitchen tablespoon to place mounds of the zucchini mix onto a lightly oiled skillet. They cooked for three minutes on one side then we flipped them over and cooked for another three minutes. They turned crisp and golden on the outside and stayed moist and tender on the inside. The yogurt dill dip is a mixture of thick Greek yogurt, grated garlic and dried dill. 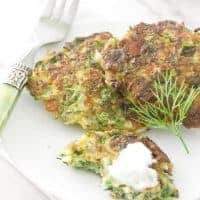 It is easy to make and delicious with these gluten-free zucchini fritters. It also makes a great veggie dip that is low in calories and big on flavor. Can I Freeze These Gluten-Free Zucchini Fritters? These little fritters freeze up really well. If you want to freeze them then we recommend spreading them out on a cookie sheet and sticking them in the freezer. Once they are frozen you can place them in a sealed freezer bag. This way you can remove the individually frozen fritters and they won’t all stick together. Otherwise, if you stick them all in a bag before freezing them then they will clump together. The problem with that technique is that you will have to thaw all of them at the same time. How Do I Re-heat These Gluten-Free Zucchini Fritters? Make sure you defrost these little fritters completely before you reheat them or they may not reheat evenly. Once they are defrosted, you can stick them in the microwave for about one minute. 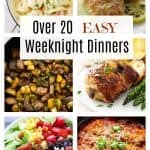 If you want them to crisp up on the outside again then grease a hot skillet and cook them for about 1 to 2 minutes on each side. 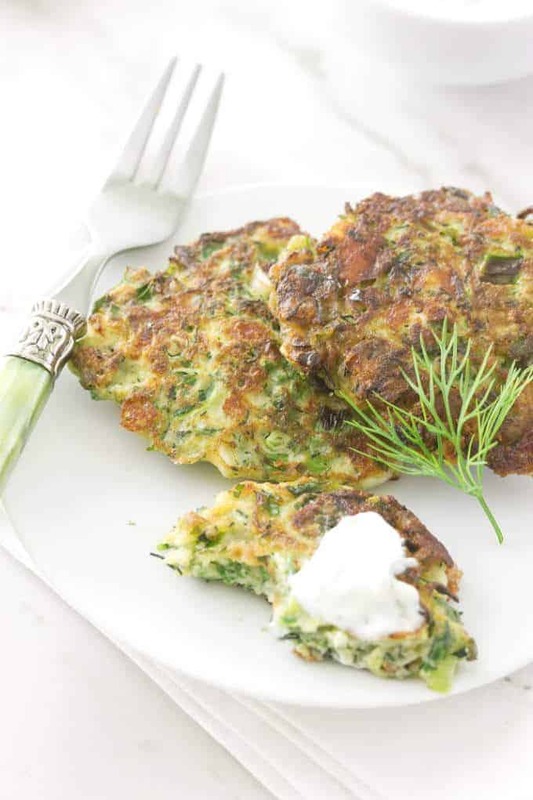 These Gluten-Free Zucchini Fritters Are Great For Breakfast! For breakfast the next morning we reheated the left-over fritters in the microwave for one-minute and topped them off with a poached egg. Yum! It was an easy, diet-worthy, delicious breakfast. Gluten-Free Zucchini Fritters! Crisp and full of feta cheese, chopped dill, parsley and garlic. A pinch of red pepper flakes adds a bit of zest to the mix. 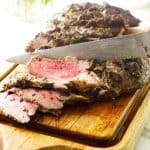 Served with a dilly Greek yogurt sauce. If you are gluten-intolerant or gluten-sensitive you can also enjoy these fritters. Set a colander over a dinner plate and line the colander with a kitchen tea towel. Grate the zucchini with a box grater or the grating attachment of a food processor. Add the grated zucchini to the colander, sprinkle with the salt and toss to combine. Let sit for 10 minutes to drain. 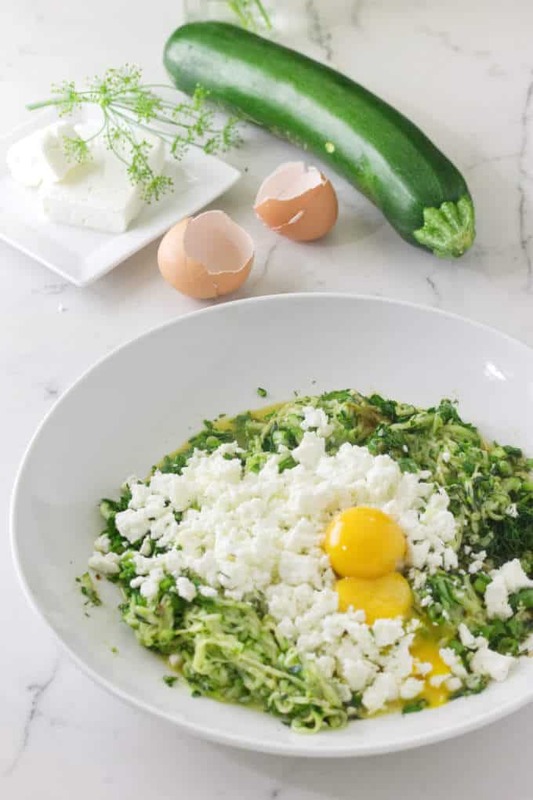 While the zucchini is draining, add the chopped green onions, feta cheese, dill, parsley, garlic and red pepper flakes to a large bowl. Whisk the eggs together in a small dish and add them to the mixture. Pick up the corners of the kitchen tea towel with the zucchini and squeeze the water from the zucchini into the kitchen sink. Give it a good squeeze to remove the excess moisture as much as possible. Add the squeezed zucchini to the bowl with the cheese and herb mixture. Sift the gluten-free flour over the zucchini mixture and stir it until it is evenly blended. Add a couple of tablespoons of oil to a 10-inch skillet set over medium heat. When the oil is hot, add a generous tablespoon of the zucchini mixture to the skillet. Cook the fritters in batches of 3 or 4 at a time. Flatten with the back of a spoon while they cook. Cook until the edges begin to turn golden, about 3 minutes, then flip and cook the other side for about 3 more minutes. Transfer the fritters to a paper towel-lined plate to drain while cooking the remaining fritters. 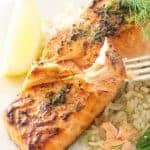 In a small dish, add the yogurt, garlic and dill and stir until it is well mixed. Add salt and pepper to taste, and serve alongside the plate of fritters. Let the grated zucchini sit for at least 10 minutes with salt on it to help draw out the moisture. Use a kitchen towel to squeeze all the excess moisture out of the zucchini but don't make them completely dry. You still want a small amount of moisture in the zucchini. These fritters freeze and reheat well. Place on a baking sheet and freeze, then transfer frozen fritters to a sealed container. Reheat on a baking sheet in a 325 oven until hot all the way through or one minute in the microwave.